Ainsworth Field in Erie, PA prior to its renovation. Thousands of fans have passed through the gates at Ainsworth Field in Erie, PA. The ballpark is located at West 23rd and Washington Place, right behind Roosevelt School. Baseball legend Babe Ruth played here. So did the Erie Sailors and the Erie Cardinals. The Erie Tigers, a name that is almost lost to history, played one season at Ainsworth in 1967. Their logo is painted above the old entrance to Ainsworth, aiding in dating this photo of the park prior to its renovation. Kids from the Schley Avenue neighborhood where Babe Harkins lived in Erie, PA. 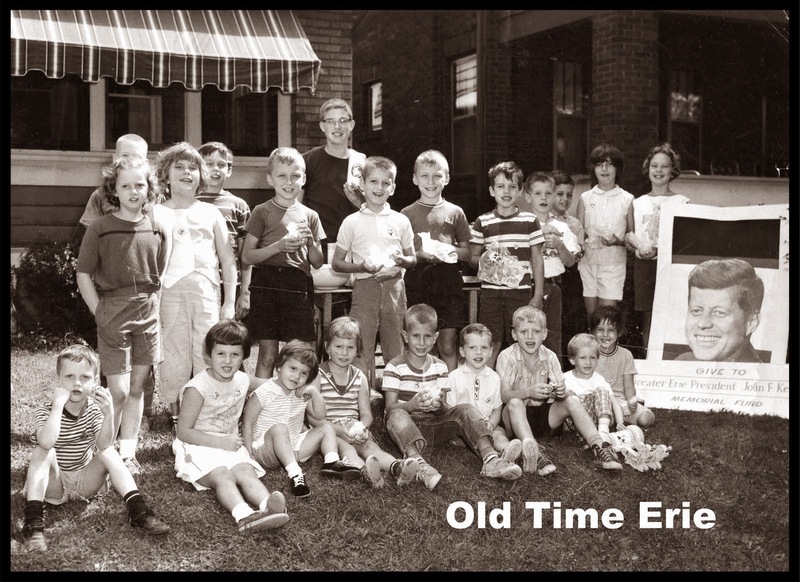 The summer after President John F. Kennedy was assassinated, the youth of Erie raised money to commission a bust of JFK to be placed in City Hall. Kids went door to door in their neighborhoods to collect money for the Greater Erie President John F. Kennedy Memorial Fund. Canisters were placed on the counters in local corner stores. Kids set up lemonade stands, had carnivals, bike races and other creative activities to add to the fund. Black crape paper was placed on old JFK campaign posters such as the one in the photograph shown here as the community was still mourning the death of the charismatic President Kennedy. Veterans Memorial Stadium before its renovation. Yes, the universal cheer to get everyone excited before the big football game- spelling out the name of the high school. Looks like these cheerleaders at Academy High School have made it to the last letter, "Y," made famous by the Village People song "YMCA." Sign language for the masses. This picture was taken in 1963 and it shows the old bleachers at Veterans Memorial Stadium before it was renovated. Listings from the 1952 Club Directory. There were a number of clubs that catered to the various ethnic groups in Erie in 1952 which are better known by their nicknames. A few that come to mind are the PP Club, the PNA Club and the CYS Club. And let's not forget the Hooksie Dooksie! Pratola-Peligna Society: The PP Club. 1601 Plum St., Erie, PA. The club had 450 members including social and beneficial. Annual dues were $12 for beneficial and $1 for social members. Officers included John Gamble, Albert DiLoreto, Nick Bianchi, Patsy DiLoreto, Oliver Franz, Louis Semintilli, Louis Benacci and Gino Cargiole. American Jugo Slav Club. 136 West 17th St., Erie, PA. Officers of the club included Harry Christensen, Philip Marnella and Robert Fischer. Arbeiters Gesang Verien Club: Arbeiters Club. 324 East 18th St., Erie, PA. The club had six bowling lanes. Annual dues were $1.20. Officers included Joseph L. Nies, Theodore Monahan, Michael Nowak and E. Andrick. Calabrese Club di Monte Carmelo: Calabrese Club. 509 West 16th St., Erie, PA. Officers of the club were Jack Fatica, Patsy Fratto, Anthony Presogna, Joseph DeFazio, Anthony DeFazio, Nick DeLaura, Dan Presogna, Ted Chimenti, Joseph Pillitieri and Louis DeLaura. The club had eight bowling lanes. Annual dues were $12 for regular and $3 for social members. Activities included bowling leagues and floor shows. Cesare Battisti Club, 301 German St., Erie, PA. Officers included Paul DeDionisio, Frank Damico, Armand Chimente, Anthony Chimente, Al. DeDionisio, Anthony Mando, Marc Alberico and Edward DeLuca. The club had 200 beneficial members, whose dues were $12 per year, and 300 social members whose dues were $1.20 per year. Initiation fees were $5-10 depending on age. Community of Young Staroobriadcy: CYS Club. 155 East 2nd St., Erie, PA. Officers included Fred Simon, John Petroff, Fred Orloff, Charles Pancerev and Matt Federoff. The club had 900 members. Danish Club, 1114 West 8th St., Erie, PA. Officers included Peter Larsen, Harry Sorensen, Wylie Hansen and Andrew Nielsen. the club had 400 members and annual dues were $1. Graeco Americus Society. 1511 Peach St., Erie, PA. Officers included Charles Ramandanes and Gus Katos. Gwardja Huzarow-Karzmierz Pulaskiego i Tad. Kosciuski: Huzars Club. 1120 East 10th St., Erie, PA. Officers included Adolph Prawdzik, Edward Maciukiewicz, Paul Lipiec, Joseph Dworakowski, Edwin Slupski and Joseph Zielonka. Incorporated in 1935. The club had 900 members. Annual dues were $4.20 for beneficial and $1 for social members. Activities included bowling and softball leagues and dancing. Holy Trinity Portugese Association: Portugese Club. 1043 West 5th St., Erie, PA. Officers included Harold Fratus, John Costa, Anthony Costa, Joseph Viera, Carlo Santo and John Maio. Lithuanian Alliance of America, Lodge No. 216. 806 Parade St., Erie, PA. Officers included Anthony Matulevick, John McShane, Joseph Zdunski, Catherine Matulevick and Joseph McShane. The club was incorporated in 1946. The club had 1,426 members. Annual dues were $1. Nuova Aurora Society. 1518 Walnut St., Erie, PA. Officers included Simone Fromzaglia, Elmer Mazzei, M. J. Leone, Anthony DiCorpo, Leon DiCecco, Frank Necci and Dan Carbone. Incorporated in 1907. The club had 2,200 members. Activities included mushball, baseball and bowling leagues. Polish National Alliance: PNA Club. 557 East 21st St., Erie, PA. Officers included Vincent Chrostowski, Joseph Rogers, Walter Kanonczyk, Joseph Kozlowski and Edmund Cieslak. Incorporated in 1936. The club had 1,500 members. Activities included a drum and bugle corps, bowling, dancing and a slow pitch league. Polish National Club. 2114 Wallace St., Erie, PA. Officers included Joseph Wisniewski, Edmund Olszewski, Paul Kita, F. Benes and Frank Martyna. Incorporated in 1918. The club had 275 members. Polish Sharpshooters Club. 650 East 12th St., Erie, PA. Officers included Joseph Lewandowski, John Cleramadzki, Snelly Sandusky and Andy Desser. The club had six bowling lanes. Russian American Club. 262 East 3rd Street, Erie, PA. Officers included John Mickol, Alex Puchinsky, Stanley Lata, Nick Maly and Daniel Zuk. The club had 750 members. Slovak National Club. 902 Hess Avenue, Erie, PA. Officers included William Galla, Michael Bules, John Krkoska, John Bebko and Stephen Duska. Slovak Social Club. 902 Pennsylvania Avenue, Erie, PA. Officers included Anthony Samol, Francis Palkovic and John Duska. Incorporated in 1942. The club had 500 members. Societa Dimutuo Soccorso di Pennapiedimonte: Penn Club. Societa Nazionale Dimutuo Soccorso Dimontenero Valcocchiaro Club: Monty Club. Thadeus Kosciuszko Branch No. 610: Polish Falcons Club. 602 East 19th St., Erie, PA. Officers included Joseph Walczak, Leo Hokaj, Ed Zasada and Joseph (Gardner) Ogrowczyk. The club had six bowling lanes. Annual dues were $3. Ulpia Traiana Society: Roumanian Club. 1133 Pennsylvania Avenue, Erie, PA. Officers included Florian Hada, George Romocea, John Gaspar, Thomas Radu, Tom Jackson, Jacob Luca and Charles Dumbravo. Incorporated in 1906. The club two bowling lanes and 450 members. If you have more information about these clubs circa 1952, or know of any ethnic clubs that I have forgotten to list, please send me an e-mail. Surely one of you has old membership cards tucked away somewhere. Descriptive List of Deserters courtesy of Pennsylvania State University. I debated writing about the deserters of the 145th Pennsylvania Volunteers. The purpose is not to tarnish the names of any families, but to point you to a seldom used source for genealogical research. The example shown above is from the Descriptive List of Deserters from the 145th Regiment of Pennsylvania State Volunteers, which I have included because it lists a number of men from Erie Co. Many researchers are aware of Samuel P. Bates' History of the Pennsylvania Volunteers, 1861-65, which lists name, rank, regiment, company and the date the person mustered in and out of the service. This series also tells if he was wounded or died of wounds or sickness while on active duty. The Descriptive List of Deserters gives some additional biographical information, including a physical description (age, height, complexion and color of eyes and hair), place of birth, residence at enlistment and occupation, place of enlistment or enrollment and the name of the officer who enrolled said person. Surprisingly, deserters were not limited to privates; there were plenty of men of rank, including corporals and sergeants. In the photo shown above, Edwin M. Kelsey, a private in Co. K, 145th PA Vol., age 50, was 5'4.5", had a dark complexion, black eyes and black hair. He was born in Erie County, PA and was a seaman. Edwin resided in Erie Co. when he was assigned to this regiment on August 8, 1862 by Capt. Walker. He deserted on August 31, 1863 from the U.S. General Hospital. The 111 men on the descriptive list held a variety of jobs prior to joining the 145th, including a butcher, a blacksmith, a carpenter, a cooper, a bar tender, a farmer, a shoemaker, a fisherman and a liquor dealer, to name a few. Ages ranged from 18 to 50 years old. Click here to view the list of 111 deserters from the 145th PA Volunteer Infantry. 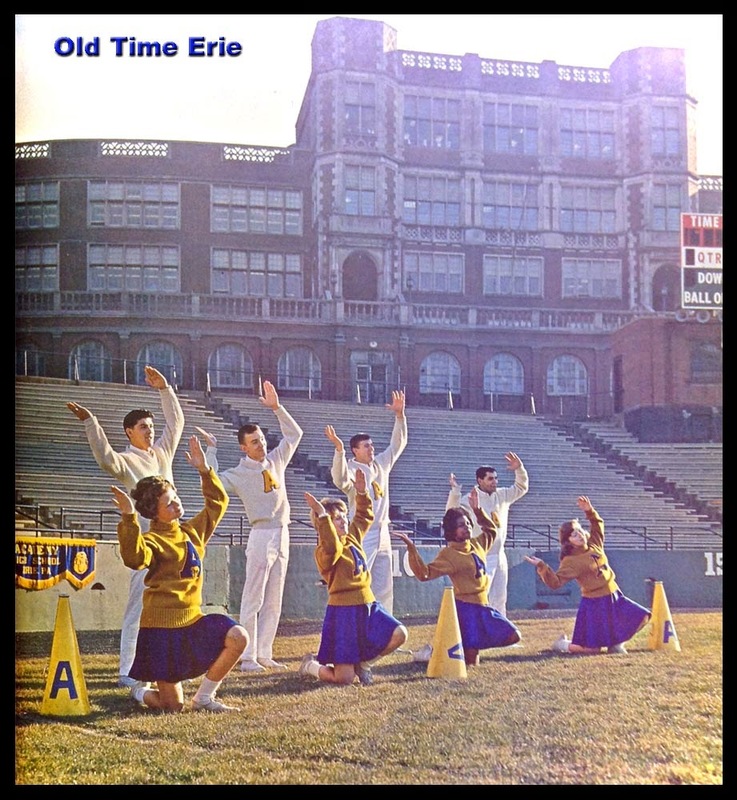 Find more historical sources and facts about Erie, PA at Old Time Erie.